Broken Sky Chronicles- Book 1..."No one but the dead dare venture Below . . .The first volume in this thrilling trilogy opens on the barren plains of Below, where Hokk and his fox sidekick, Nym, live in exile amid the remnants of our modern age. Overhead, on the floating islands of Above, Elia is trapped in a life of endless toil and drudgery as a laundress for the Mirrored Palace. To Elia, the islands edges are borders that no one dares cross until the ancient ritual that delivers the dead to Below. But a series of natural disasters rumbling through Above sends Elia's world crashing into Hokk's and she falls Below.Their journey together will propel them across endless plains and through shattered cities in a centuries-old battle for the very earth and sky around them . . ."When I read the synopsis for this book it reminded me of the The Internment Chronicles by Lauren DeStefano. I really enjoyed that series so I was excited to be able to read Below and revisit another similar structured world.While I enjoyed this story also, I felt like we were just kind of thrown into this alternate world and didn't get any back story on it. I also felt like some of the writing and dialogue could use a little bit of polishing. I do really like the world though. I think the old world characters and life style (think Tearling series) lend it charm.Although the world building is similar to some other popular books, the plot however, was a very fun and thrilling adventure of its own and really what I enjoyed most about the story.Will I read the next book? Yes definitely, but I hope the sequel fills in some of the missing pieces. *I received this ARC from Edelweiss & Turner Publishing in exchange for an honest review. Thank you! Received an arc of this book from Turner Publishing for an honest reviewWhat if you thought you knew what the world below was like and it was all wrong? Elia lives in Above, a floating mass of land that hovers above the clouds. The moon is cracked, the sun shines bright and she has never experienced rain before. She lives a simple life with barely any food, water packets and spends her day forced to work as a clothes washer. Living in a very simple home with her parents and grandparents and also living to see the day that horses fly and donkeys grow wings.Mysterious things are happening to people surrounding her and when her jobs were switched from washing inside to drying outside things change for the weirder. A lady shoves a box at her and tells her to guard it with her life, not knowing what to do, she hides it on herself as the commander finds the lady and forces her to tell him where this mystery box is located. When he doesn't get his answer, he does the unthinkable and Elia starts running for her life and then............She falls down.......down she goes.......through the clouds......ears feel the pressure.......her limbs feel tight......her heart starts to race.....and she gently floats to the bottom.Elia is in for quite the adventure now.I have so say, this read surprised me. I actually kind of enjoyed it. It wasn't so science fictioney at first and it draws you in. After Elia falls to the Below that's when it gets stranger. The main characters are likeable, but not much happens as a background. They develop along a little slow for my taste, but the second book I think will move them along nicely. Usually me and dystopian novels don't get along. But I think this would change anyone's mind. Actually looking forward to picking up the second book, just to see where this is all going and maybe a little love will bloom. A girl can only dream. In “Below” the first book in an intriguing dystopian trilogy, Jason Chabot brings to life a world with drifting islands that float in the clouds above a post -apocalyptic wasteland below. Often drifting close to the earth below, they dig craters in the ground until rising in an air current into the sunshine above. On one of the islands in a realm ruled by Twin Emperors who share power in an unstable truce, Elia lives with her mother, brother and grandparents, works as a laundress in the “Mirrored Palace” and has nightmares about the wilderness below where she’s sure “scavengers” lie in wait for the bodies of the dead traditionally thrown over the edge. Hokk, exiled from the City of Ago wanders the barrens of Below with his fox Nym foraging for food, searching for shelter during the violent thunderstorms while evading the Torkin. Worried that the floating islands ripping into the land when they draw too close may prove to be disastrous for his city, Hokk decides to take the news to the council when he discovers Elia, a dead body and a mysterious box near the shoreline. Tying her up and taking her pack they set out on an adventure that will climax in death and destruction neither expected.Packed with adventure although the pace can be slow at times, the plot heats up when Hokk and Elia journey across the ruined land to warn the city about the danger only to imprisoned by the city’s officials and to be chased by the Imperial Guards hunting for Elia on their winged horses. Mystery and suspense intensify with twists that include the request of a lady-in-waiting that will bring death to Elia’s grandparents and have her safeguarding a secret hidden in a box; Hokk’s betrayal; and her joining the band of Torkin sent to overthrow the council.Skillfully Jason Chabot creates realistic and compelling characters that develop in complexity as the plot develops. Elia sick of the drudgery of her work is swept up in a conspiracy that has her grandparents killed, her home floating away and protecting a prized possession that could undermine her world. Proud, stubborn and feisty she’s drawn to seventeen-year-old Hokk whose carelessness and love of fire brought about his exile for ten years. Determined, resourceful and quick-witted he struggles to protect Elia from those chasing her only to lose her after freeing the colt of a winged donkey.With questions about a landscape that’s threatened from descending islands, a city on fire, and secrets surrounding Elia, her family and a mysterious artifact that’s being hunted, this is a story I expect will get better with each new book. And I look forward to continuing Elia and Hokk’s adventure in the sequel. This book was provided to me as an uncorrected digital review copy by the publisher, via Edelweiss.Elia lives Above on a floating island, and has been taught to fear the eyeless, hunchback, monstrous scavengers from Below. Hokk lives Below, and has no idea what happens on the floating islands Above. His only concern is surviving the barren wasteland to which he has been banished. When Elia falls from her island and is discovered by Hokk, they have to learn to set aside what they think they know in order to survive long enough to make it to the city from which Hokk was cast out 6 years ago.It was a little slow going at first, but by the end of the this book I was all about Elia being a BA and rooting for Hokk to find something worth respecting in himself. These are complex characters. Every time I thought I had them figured out, something new would pop up. The action was intense without being ridiculous or gratuitous, and the dialogue felt natural. The world-building is a little complicated, because there is so much that the inhabitants don't yet know about the relationship and origins of the Above and Below. This only adds to the suspense, and has me looking forward to the second book even more. I would recommend this book to any teen who enjoys a good fantasy adventure. "Below" by Jason Chabot would make a wonderful movie. The novel is Book #1 of a trilogy.His descriptions are very visual: “The Scavengers of Below were horrendous, pale creatures that clung to the islands with their claws . . .Their spines were curved, and their limbs scrawny with knobby elbows and knees. Most horrifying of all, Scavengers had no eyes, just bulging foreheads above two holes for nostrils and white lips pulled taut over toothless gums.” The story moves at a good pace and there is enough taking place to keep the reader engaged.Thank you GoodReads for the book. I can't remember the last time I actually finished a book I grabbed randomly from the library, so kudos to this book for that, at least.I actually found the world fascinating, and I feel like the author did a good job of presenting Above and Below, and what the lives of the main characters were like in each place. I felt that he weaved the differences of Above and Below into the story in a natural way. It's nice to see an author actually carry their unique idea throughout the entire story--something that is neglected far too often in YA stories.But the characters and plot were utterly lacking.The main girl--the character from Above--is not a proactive protagonist, at all. She has no personality. The same is true of the main boy, the character from Below. They're just poorly developed. And the plot is kinda nonexistent: he's an outcast in Below trying to survive the plains and find a way to bargain for his freedom back in the city. She's a girl whose grandma mysteriously dies, and she's supposed to protect some mysterious important box, and she falls to Below and is trying to find a way back home.And that is that. NOTHING is revealed--not why the thing in the box is important, not why her grandparents are killed, not why Above and Below are separate spheres yet of course the leaders of both are familiar with both, not why the islands in Above are falling. So while the world is creative, the actual world-building is awful. The story ends on a cliffhanger with nothing explained. There is no depth to anything.I won't be continuing this series, but I'm glad I got myself to finish this book. Received this in a giveaway from Goodreads in exchange for an honest review. I really liked the premise of this novel once I got into it, the only problem was that getting there was super slow! It took me so long to get into this book and finally finish it. Overall it has great characters and good action. 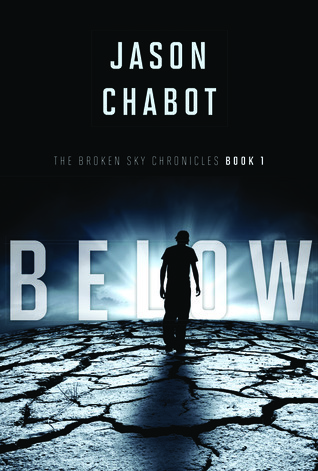 Below by Jason Chabot is dystopian fiction at core, filled with action, suspense and of course some romantic tension happening. It's different, and I like that it's different, but there are times where it drags a bit. The early parts of the story is the "getting to know" phase and to understand the world of above and below. As we start getting into the development, it lacks more depth. However, once we're into it, the action picks up and bang, it leaves us with a cliffhanger! I'm still unsure of how I feel of Hokk and Elia. Nym is obviously the cute little one, but our two main characters have not truly grown on me yet. With all that said, don't be surprise when I say that I do like it and I look forward to the second book of The Broken Sky Chronicles, Above. It's one of those stories that doesn't "hit" you until you've read it in it's entirety or let it sit in you for some time. It's one of those I put on the "must read again" to fully appreciate the ingenuity of its dynamics and characters. So, yes, I do recommend it, and I gotta admit, that cover is quite interesting. This review first appeared on Just Commonly blog.NOTE: I received a complimentary ARC of this book from the publisher for an honest review. All opinions expressed are my own. For my review policy, please see my Disclosure page. Hokk was banished from the city in which he lived for an accident that caused the death of several other. The spends years, almost always alone, trying to survive on the vast plains. Huge islands sail in the skies above, also peopled by cities, the citizens for the most part unaware that there are people like themselves living below. On such island Elia works in the huge laundries of her city cleaning the clothes of the royals and wealthy, she has little hope of improving her lot.One day a series of events cause her to fall from Above, as her island begins sinking close to the world Below. Surviving the fall she is soon discovered by Hokk, who sees her as a way to earn his way back into the city and return to his surviving family. Soon, both learn that there are events going on that will effect the future of the citizens of the Above and Below.Nice SF/Fantasy novel for Young Adults. Chabot creates, in this first book of a planned trilogy, an interesting world of flying horses and thousands living in the ruins of a once modern technology which most can't begin to understand or remember.This is my review of an advance copy sent to me for an honest review. (Reviewed from a galley, courtesy of Turner Publishing)Exiled criminal Hokk and his pet fox, Nym, stumble upon Elia when gravitational shifts and ensuing earthquakes break apart her homeland in Above, a floating series of islands above the clouds, and send her plummeting to the barren wastes of Below. As they run to escape both airborne and terrestrial dangers, they must work to decipher the significance of a prized wooden box which may reveal a secret powerful enough to bring down a kingdom.Writing a successful dystopian series in a post-Hunger Games world is no easy feat, but Jason Chabot does it with Below. The characters, although a bit underdeveloped, are easy to root for and the world is adequately described as what seems like an Earth hundreds or thousands of years in the future. There is of course some romantic tension between Hokk and Elia, and plenty of action sequences, but their dialogue feels forced and unnatural at times. Nevertheless, readers will be looking to read the next installment of this fresh and original series post haste. Below by Jason Chabot was a good quality fictional novel. The story and plot line had wonderful ideas within it. It had good direction and would be great for a Young Adult or Pre Teen reader. I was not super into this book, but it was good quality. Personally I found it very boring, but clearly the author thought out his ideas. There wasn't any crazy development, and I did expect a bit more. Perhaps a younger audience would find this book entertaining, but sadly I did not.I would still suggest people read it who want a book similar to Divergent or The Hunger Games. It wasn't horrible, but it also wasn't my type of book. I didn't understand the floating island or where the plot was going, but it was still a good story. Perhaps if someone who enjoyed the book gave me a general overview and then I reread it, I might find it more enjoyable. Overall, I wasn't to impressed but the story wasn't aimed towards my "type of reader". Two out of five stars.I received this book for free through Goodreads First Reads. An unremarkable but enjoyable first book in a dystopian trilogy. Although set in our world, with landfills and plastic bags, there are also winged animals and land-mass islands floating above the surface of the planet. Hokk was banished from the City of Ago for setting a fire that killed people and makes a living on the plains as a scavenger; Elia lived Above, a servant for the Twin Emperors, until she was caught up in a plot she didn't understand and fell Below. She meets up with Hokk and his pet fox Nym, they form an uneasy partnership, and they make for the City of Ago. I would put the writing at the lower end of the intended age 12-17 audience. There is no real sense of peril at any point and the relationship between Hokk and Elia seems quite young. The world building and character development is decent. Many plot points are left unexplained for future books in the series. I would recommend this to fans of John Flanagan's Ranger's Apprentice series, and I am interested enough to read the second book in the series when it is published in the U.S. next month. I LOVED this novel! I was given given a review copy from Turner Publishing for my honest review and I honestly loved it.The book is based in the future and its like a "what if?" of what the world might be like if we do not start taking better care of the Earth. The book follows Hook and his fox who are from the land of Below and Elia who is from the land of Above. Yes the names of the places are a bit lame but hey some times lame is good and in this case it works. Anyway Elia falls to Below and all heck breaks loose and the two have to work together to get out in one piece. Then to keep you on your toes the book ends at the worse/best point in the story (best point because it gets you wanting to read book #2...when it comes out. )I find the writing to be very well done and it (to me) has a great story line. The book is quite "clean" reading (if you over look all the death) until you get about 2/3 way though the book then the swear words start to get bumped up. So just a heads up on that. So over all I am giving this book 5/5. This book was just meh. The story has some great ideas and I'm sure it'll go in a good direction, but I just wasn't that into it. The characters were all right, but they didn't have a whole lot of development. To be honest, they didn't have a lot of anything at all. The plot could have been much better too, if the author was more clear on the whole when and where of everything. I know that some books set in the future can be really good if they leave some details to be divulged later, but I just felt blind throughout the whole book. The whole floating island thing didn't make sense and neither did any of the explanations. I got through it without them, but if the author had developed his world more I could have given it a better rating. Hopefully, things will be better explained in the next one. I received a copy through goodreads first. Jason Chabot is talented. This book flows so well. I didn't want to put it down. The characters are interesting and Chabot doesn't give to much away at the beginning. I loved how the two worlds intertwined throughout the book. There is a lot of action and adventure to keep you into the story. There are lots of twists and turns that you would not except. Below keeps you on your toes. I would recommend this book to both female and male readers. The description of the book is exactly what your going to get and after I read the book I was not disappointed. I'm so happy it's a series because I wanted more at the last page. I cannot wait for the next one in the series. I got a free copy of this book in exchange for an honest review. Here it is:I liked the setting and background premise for this story. Earth, in the future, but when the moon has broken into pieces, and giant islands float above the sky, circling the Earth; flying horses/stallions; separated versions of humanity living either below the clouds, or high on the islands; it is all very interesting. However, I was not as interested in the actual plot. The setup was good, but the storyline wasn't anything spectacular for me. Not that it was bad, per se, but it wasn't good either (for me). Jason Chabot - I live in Vancouver, British Columbia, but grew up in the rural outskirts of a city called Chilliwack – a Stó:lō First Nations word meaning “quieter water up the river” – where our home was built beside a gurgling creek and surrounded by forests. With no neighbors in sight and only one channel on TV, I had plenty of time to invest in my imagination.Looking back, the seed for The Broken Sky Chronicles was first planted as a teenager when I worked at a tree nursery that supplied saplings to reforestation programs. I didn’t think a summer job could get any worse – the burning sunshine, the dirt, my aching back, the relentless little flies, always biting. I used to gaze up to the mountain peaks poking above a halo of clouds and wish I could somehow, miraculously, be transported to their alpine meadows, to relax for hours while watching everyone else slave away, far below, in the afternoon heat. “Above” always seemed like the ideal place to be, although I now suspect the bugs would have been larger and definitely more ravenous.Many other elements of The Broken Sky Chronicles were inspired by places and moments in my life. Growing up on the West Coast, I have always been captivated by nature, whether by our storms, our oceans, or our sunsets. In Vancouver, we are always warned that the Juan de Fuca fault line is long overdue for a horrendous earthquake – so be prepared! And during an amazing trip to Egypt, I was surprised many times to see plastic trash everywhere, half-buried in the sand dunes or floating high in the air, caught in the currents where clouds should be drifting instead. I chose to write a fantasy adventure novel for young adults because I was intrigued by all these natural elements and how they might affect the lives of two teenagers when their physical worlds collide. While Elia has been enslaved by class and drudgery, Hokk lives in almost complete isolation, and I have enjoyed exploring how each character discovers unexpected strength to survive epic challenges, yet at the same time questioning their perception of reality.But of course, I suppose Hokk and Elia could have had it worse. They could have worked in a tree nursery!